Andy to his friends, he's a postmodern renaissance hippie who used to program computers for NASA but now designs games for a living. He also writes stories, draws cartoons, takes photographs, opposes unjust laws, and unbeknownst to most, also rules the universe as an ineffective figurehead Emperor. At the time of this writing, he was 37 years old and living in the suburbs of Washington DC, with 3 cats, 2 women, 1 bird, some fish, and a super evolved stalk of broccoli named Tirade. He is bald but wears the hairs he does have as long as he can grow 'em. 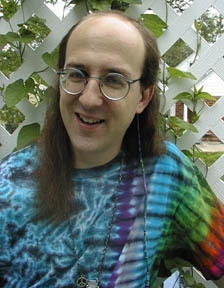 He also wears tie-dyes and Hawaiian shirts, round wire-rimmed glasses, and a watch on a chain around his neck. He's a non-drinker, a meat-eater, and a chocolate-lover, he hates the telephone and organized sports, he loves staying up all night, he prefers bathtubs to showers, and he's tired of talking about himself in the third person. My online brain is woefully out of date, but you can still learn a lot about me by exploring it. The best way to contact me is by sending email to andy@wunderland.com. Fluxx - Of everything I have created, Fluxx is without a doubt the most successful. Over 44,000 copies of Fluxx have been sold thus far, and among other distinctions, it's been given the coveted Mensa Select gaming award. It's showing every indication of becoming not simply a hit, but a gaming classic. We hear stories over and over again, of how people fell in love with this game and played it all night long... but sometimes they're truly poignant. I've been told that playing a few rounds of Fluxx has helped some people get through difficult times, including the aftermath of a guest of honor's death at a convention, and the struggle to stay alive by someone in the hospital. It's an awesome thing to know that you have created something that brings people together and inspires joy and happiness. Wow. The Icehouse Set - In 1987, I wrote 5 paragraphs that changed my life. In them, I described a really cool sounding fictional game in tantalizingly incomplete detail. That description started a 10 year struggle to manufacture a set of game pieces, which has come to provide a gaming experience that is every bit as rich and exciting as the ones I first dreamed of in the summer of '87, back when I thought of myself not as a game designer, but as a writer. John Cooper took my incomplete notions of a real-time boardless Icehouse game and created the eponymous game which was the only one we had for many years (and for which we were granted US Patent #4,936,585); but once we had the next generation game pieces, which stacked, I invented a turnless boardless game of my own, called IceTowers. I've invented several other Icehouse games too, but besides IceTowers, Martian Chess is the only other one I've done that really seems to pass the all-important "Let's Play Again" test. Chrononauts - Time travel has always been one of my favorite subjects. During the spring of Y2K, I took everything I knew about Quantum Mechanics and mixed it with everything I'd learned (mostly through trial and error) about Game Design, and came up with an elegant, exciting, and totally unique time travel card game. It's got fast, fun gameplay, eye-catching art (with color by Alison), a rich and involving backstory, and of course, the coolest of all possible topics. It's already becoming another hit for us, and it's won several major awards, including the Origins Award for Best Traditional Card Game! Aquarius - The artwork for my second family card game is a tribute to the visual stylings I grew up thinking were cool (which, oddly enough, are currently back in style), and I think it represents the zenith of my artistic achievements. I've always felt my artwork is usually just passable, but people I don't know use words like "awesome" to describe the Aquarius art! The gameplay too is a proven winner, at least in many people's opinions... as with Fluxx, there are those who find what is emerging as my style of game design too chaotic and crazy for their tastes. But hey, you can't please everyone. Icebreaker - I spent 2 years working in Georgetown for Magnet Interactive Studios, which hired a huge staff of programmers and artists to design and build video games, but then down-sized the division, with many projects being shelved half-completed. Among the titles that were actually released was this abstract arcade game of pyramid vandalism, which I created, designed, and wrote most of the software for. Unfortunately, the original version died with the 3DO game system I developed it on, and poor distribution and bad timing strangled the Mac/Windows versions, when they hit the market some months later. But hey, the 5 level demo is still available for free, so go download it and see why Games Magazine named Icebreaker the Best New Action-Arcade Game on the Electronic Games 100 back in 1995. HST Flight Software - I spent 8 years as a government employee (GS-13), working at NASA's Goddard Space Flight Center. Among other things (including working for Jim Chesney and meeting my lovely wife Kristin), I wrote software that orbited the earth, on the Hubble Space Telescope. It was installed during the 1993 servicing mission that fixed the flaw in the lens (although my code was related only to a new 386-based flight computer that was installed primarily as a backup). My code flew in space until the Third Servicing Mission, when the computer my stuff helped upgrade (the DF-224) was completly replaced. Bachelor of Science Degree - It took me an extra year and my GPA was only 3.1, but I graduated from the University of Maryland with a major in Computer Science, back in 1986. (I also took a lot of Art and English classes, fought in numerous medieval battle recreations, and co-wrote several of the first few Live Action Role Playing games.) Before that, I graduated from Northwestern High School, which like my elementary school in University Park, has since been demolished and replaced. Eagle Scout - My earliest major achievement was the attainment of the rank of Eagle, in the Boy Scouts of America (Troops 728 and 214). I also bicycled the full length of the C&O canal twice, made the pilgrimage to backpack at Philmont twice, and was awarded Vigil membership in the Order of the Arrow (where my Indian name is Sakima Meteu). My Boy Scout involvement also included membership in Explorer Post 1275, where I met John Cooper, had my first regularly published Something (a cartoon in the monthly newsletter called "2001 BC, A Spam Oddesy"), and played my first text adventure game (the original Colossal Cave of course), using NASA computers at GSFC. Wunderland.Com - For over 3 years now, I've been editing a free weekly webzine, filled with fiction and essays, photographs, cartoons, and news on local happenings. The site now boasts over 3000 pages of content, contributed to by an online community of friends (the Wunderland Toast Society). The online content I've provided includes short stories (Nanofiction and My Secret World), a short novel (The Empty City), radical opinion pieces (Stoners in the Haze), a photographic portfolio (My Image Wall), cartoons (Iceland and Sketchbook Harvest), a Virtual Brain, Thought Residue, the Long Hair Index, and plenty of other stuff. (I also tell Tirade and Daddy-O what sites and movies to review.) I update Wunderland once a week, on Thursdays, so if you want to know what's going on in our lives and with our business, you need to be reading the WWN. My Many Enduring Friendships - My wife Kristin, my best friend John, my housemate Alison, and my circle of close friends... these have been key players in my numerous successes, and are among my greatest joys in life. Churches and families must accept you when no one else will, but friendships you must build for yourself, and I especially value this last accomplishment since I don't plan to breed. More Patents: I've already filed a patent application for the method of play embodied in IceTowers, and plan to get one in for the Chrononauts TimeLine before Origins. Soon to be a Major Motion Picture: I plan to continue writing stories, with both words and pictures, until something I create is turned into a movie starring a big name actor as a character I created. When I eventually tie up the stories unfolding in Iceland, we plan to publish the collected panels as a cartoon book, and I have other works of fiction waiting to be written (or even just finished up... my second novel, Playing Chess with God, is 90% complete, but long forgotten on the back burner) including The War on Dogs and a Nanofiction novel (a series of 100 or so very short stories, which taken as a whole describe life on the planet of walled cities). The Shrine of Long Hair Worship: A high-end coffee table book filled with long hair photographs (most of which I have yet to take). Around the World in 80 Days: I want to take such a trip, not to prove it can be done of course, but simply to spend that length of time touring the world (and joining the 7 Continents Club in the process). The Aurora Borealis: I want to see the northern lights (a really good display, unlike the murky glow I glimpsed in 1985). The Wunderland Field Office: Once we become hugely successful, we plan to establish a second residence, in a distant city, thus enabling me to travel with just my wallet and keys (and a purple bag of games in case there's a disaster and I end up becoming stranded on a desert island or some such). The Wunderland Coffeeshop: I'm hoping to have played a part, however small, in the undoing of marijuana prohibition, and plan to subsequently open a gaming parlor and Amsterdam-style coffeeshop in whatever groovy American city we choose for the Wunderland Field Office (top 3 candidate cities at the moment: Asheville, Pittsburgh, and Boulder). To Fly: I want to earn my hang-gliding license (so I can fly, over the dunes and beyond) or better yet, I'd like to get one of those auto-gyros, like that guy had in the Road Warrior. A One-Way Trip into the Future: Walt Disney didn't do it, but I'd really like to. I want to be cryonically frozen when I'm 77, and revived in the distant future. I want to behold for myself what future generations think of (and do to) my creations. Note: Most of the stuff on these web pages was created by me and I'll be sad if you steal it. In other words, copyright © 1997-2001 By Andrew Looney.